Born in the city of. Komarin of Bragin district. Honorary citizen of the town of Bragin (1997). Belarusian art critic, artist. Candidate of Art Criticism (1969). In 1969 he graduated from the postgraduate course, and in 1990 he successfully defended his doctorate in Moscow and became the winner of the prize of the Republic of Belarus. Member of art exhibitions since 1963. Since 1966 he worked at the Institute of Arts, Ethnography and Folklore of the Academy of Sciences of the BSSR (since 1969 senior researcher). 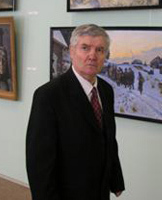 He researched the modern and ancient book and easel graphics of Belarus, including the artistic heritage of F. Skaryna. The author of cartoons and cartoons for the magazine “Vozhyk” (1960-1970 gg.). He lived and worked in Minsk, was the director of the only museum of ancient Belarusian culture in the country. He is the author of many famous canvases and a huge number of articles and publications. Repeatedly exhibited his works abroad. With particular success was an exhibition in 1995 in France. After the accident at the Chernobyl nuclear power plant V. Shmatov created an initiative group to save monuments of ethnography and folk art. For 10 years, we exported instances of the 30 km zone of the areas affected by the Chernobyl accident. More than 600 monuments were exported. On their basis a museum of ancient Slavic culture was created.